Singh, who's debut feature film "Anhe Ghore Da Daan" went on to win National Awards for Best Direction, Cinematography and Best Feature Film, says his movie was hardly publicised and given screens to be shown. "We are in desperate need to have a parallel distribution system. Multiplexes don't want to show our films today. When my movie was shown by PVR in Mumbai, Delhi and Punjab the tickets were priced at Rs 900, 400 - I was shocked. "In Mumbai my movie was only shown for five days when the hall was 80-90 per cent booked. They removed it because next day 'Ek Tha Tiger' was releasing and they wanted all the screens. "This is an exciting phase for independent cinema in India and I feel that there should be chains of theatres to show non-commercial and art house films because the audience for such movies does exist," Singh said on the sidelines of the 43rd International Film Festival of India (IFFI) here. 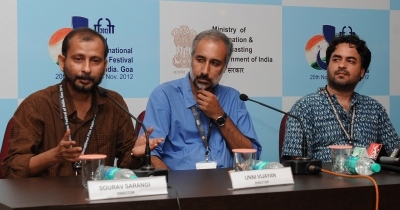 Independent Bengali filmmaker Sourav Sarangi, whose film "CHAR: the No-Man's Island" is being screened at the Indian Panorama section here, says the Bollywood impact on the silver screen makes it difficult for art house and documentary films to survive. "We find audience in other countries, we are happy about that. But it hurts that I can't show my film in my country. The non-mainstream cinema does not get proper position. This cinema actually reflects the reality of Indian films. Our honesty needs to be honoured," he said.